By wp_admin in Academic Conferences, News on December 4, 2018 . Chicago – On Wednesday, November 14th, His Eminence Metropolitan Nathanael of the Greek Orthodox Metropolis of Chicago, visited the offices of Asia Minor and Pontos Hellenic Research Center (AMPHRC). 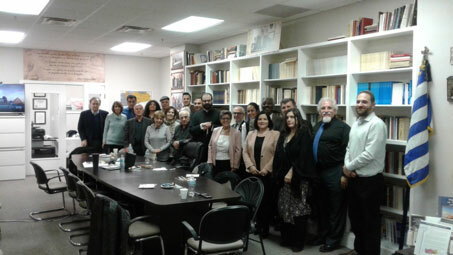 The special meeting provided an opportunityfor the members of the Research Center and the Pontian Greek Society of Chicago to acquaintThe Metropolitan with the outstanding work being done to preserve the Pontian culture through scholarly research and publishing. On hand to welcome His Eminence were several members of the Research Center and the Pontian Society, along with The Honorable Consul General of Greece in ChicagoMrs. Polyxeni Petropoulou and her husband Mr. Michalis Politis. Anastasia Spiridis -Skoupas, President of the Pontian Society of Chicago, opened the special meeting by welcoming His Eminence and presenting him with several gifts including publications by the Society and the Center. His Eminence seemed most intrigued when Anastasia described many of the educational activities organized by the Society and the Center, especially those done in cooperation with the Illinois Holocaust Museum and Educational Center and the National Hellenic Museum. AMPHRC board member, John Davis thanked His Eminence for taking time out of his very busy schedule to make his first visit to the Research Center. John spoke briefly on the vision and mission of the Research Center, while extolling the significance of the history of the Pontian Greeks darkened by their suffering in the firstgenocide of the 20th Century….The Great Catastrophe. John went on to emphasize the importance of making the facts of that genocide known to the world so that other similar genocides can be prevented. In his response, His Eminence became emotional as he spoke of his own family’s roots from Asia Minor and their similar experiences as relocated refugees in Greece. AMPHRC President, George Mavropoulos, honored by the visit from His Eminence, spoke enthusiastically about the Center’s celebrated series of academic conferences and publications of the original research papers that were presented at those conferences. George also informed His Eminence about the Savvidis Foundation project. An academic project undertaken by eight scholars who are working on original research papers on the genocide of the Greeks of Pontos and Asia Minor. 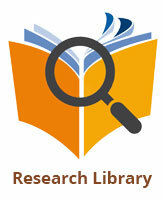 Those significant research papers have been edited and are scheduled to be published as a book early next year. George also alerted His Eminence Nathanael to the plans for next year’s centennial of the Pontian Greek genocide. George suggested that it likely would require a special meeting with His Eminence to discuss the involvement of the Metropolis of Chicago with the commemoration services as well as other activities. In his response, His Eminence stated that he is was extremely pleased to visit the Center and to see the library of the late Dr. Harry Psomiades whom he knew well while they both were in New York. He went on to express his admiration on the accomplishments of the Pontian Society and the Research Center.